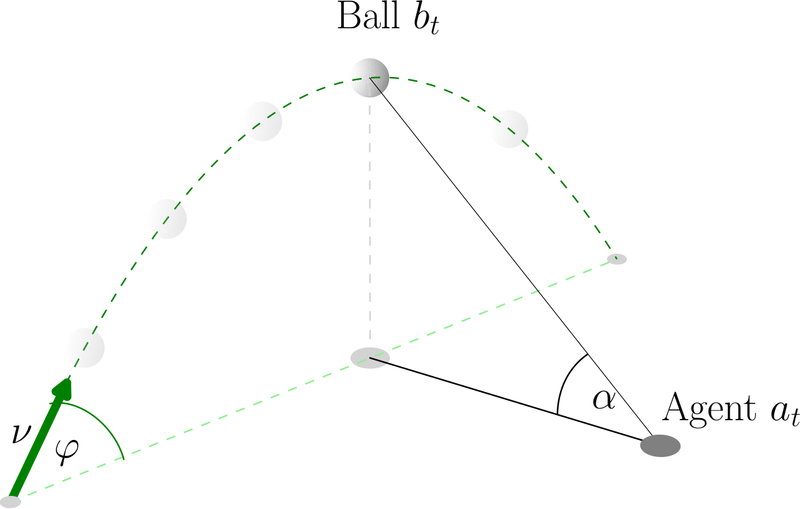 Simple illustration of the ball catching scenario. A long-standing debate in the study of natural and artificial intelligence is how to come up with robust strategies to complex decision making and control problems. Over time, two opposing views have emerged; seemingly irreconcilable, yet both supported by a broad body of scientific work. On one hand, there is the specialist view: it argues that we should employ domain- and task-specific knowledge by engineering solutions, by providing strong biases and priors or by resorting to heuristics. It is well supported by various theoretical as well as practical results in the study of natural and artificial intelligence. On the other hand, there is the generalist view: it argues that task-specific knowledge is difficult or often impossible to state explicitly, and that we instead need general purpose optimization- and learning-based approaches. Again, strong theoretical results show that, given enough data, approaches with very few task-specific assumptions will find optimal solutions, and an instance of this approach, deep learning, is currently providing impressive results, pushing the boundary of what machines can learn further and further. In our research, we attempt to reconcile the generalist and specialist views, with the goal of building better and smarter machines. We argue that the generalist and the specialist view are not contradictory, but that they lie at the two extreme ends of a spectrum. To support our hypothesis we study the outfielder ball catching problem - one of the most prominent examples in the debate between specialists and generalists. This problem deals with the question of how to most efficiently catch a baseball that is flying in the air for long period of time. Specialists (mostly in the field of cognitive science) advocate that heuristics provide the best solution to this problem and that they are employed by humans, too. Based on these findings, they argue that specialist are superior to generalist approaches because they are ecologically rational rather than trying to be optimal. Generalists (from robotics and control) argue in favor of and successfully applied optimal control and reinforcement learning to this problem. They argue these approaches lead to superior performance due to rigorous mathematical formulation of predictive models that explicitly take uncertainty into account. We study the difference between specialist vs. generalist approaches to the ball catching problem by thoroughly analyzing their theoretical and practical differences. 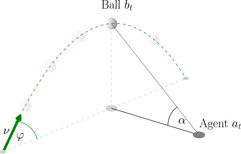 Our results show that the choice of problem representation has the most significant impact on the difficulty of the ball catching problem. This representation leaves out unnecessary information and exposes the relevant aspects of the problem space - it pretty much is the solution. This confirms our initial hypothesis that the generalist and specialist view are extremes of a spectrum -- two extremes that collapse to a single point for the ball catching problem.